I was lucky enough to be invited to PizzaBuzz, the City’s latest (and coolest) pizza joint to indulge in some good old-fashioned pizza and prosecco! PizzaBuzz is the brainchild of Barnaby Meredith, who owns a portfolio of successful gastropubs including The Portman in Marylebone, so I was excited to see what he had in store for us. 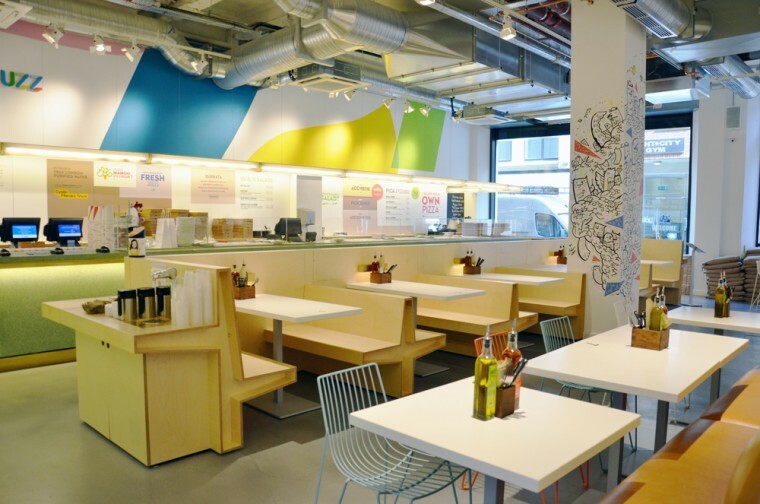 The restaurant is located on Worship St, in the brand new Alphabeta development, a welcome burst of colour around the grey city skyline. PizzaBuzz encourages diners to totally customise their pizzas from the base (including gluten-free) through to speciality cheese, vegetables and deli meats, so essentially Subway for the pizza world, only much, much better! We kicked off the evening with a selection of the Worship Street Loves pizzas, PizzaBuzz’s own signature varieties for those who hate too much choice! The Veal Meatballs was a winner for me – crushed tomatoes, mozzarella, veal meatballs, caramelised onions, sage and prosciutto – like no pizza I’ve tried before. 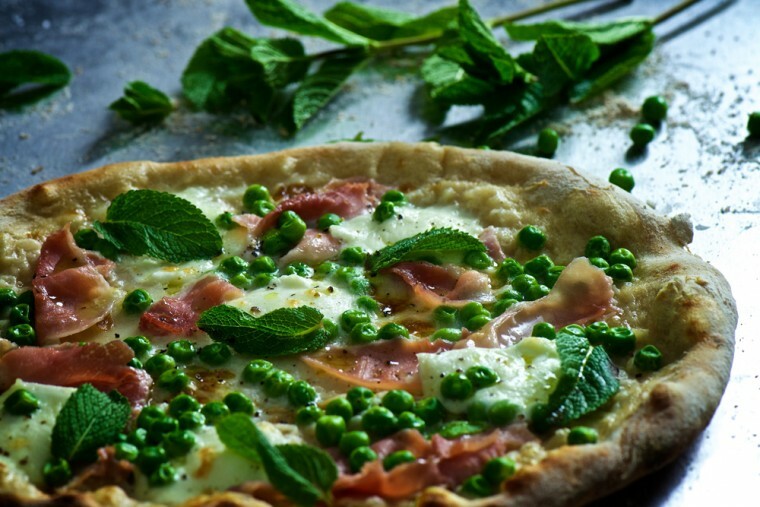 The Ham & Peas was delicious too – white sauce, cotto, English peas, parmesan, buffalo mozzarella and fresh mint leaves. We also tried a gluten-free variety of the Honour – pesto sauce, buffalo mozzarella, cherry tomatoes, garlic, parmesan and rocket – hands down the best gluten-free base I have ever tried, not at all chewy or stale like the usual gluten-free suspects. This was all washed down with a glass of Glera sparkling wine, which has been exclusively introduced to the UK market for the first time and an absolute steal at £3.95 a glass. We were then invited to ‘do the line’. 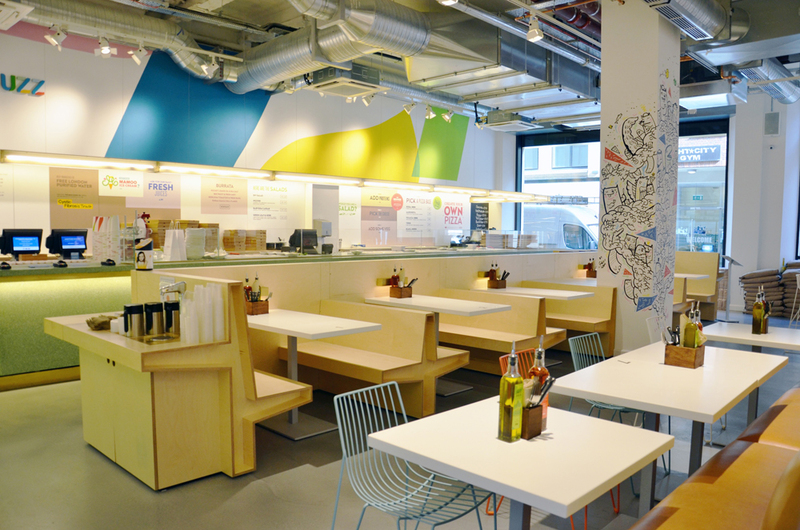 This involves making your way up the statement terrazzo service bar and choosing your base from a selection including the Foccacia (£5.50) – mozzarella, parmesan, garlic, oregano & olive oil and the Verde (£5.95) – pine nut basil pesto, mozzarella, parmesan. These are 12” pizzas and ridiculously good value. You then add your protein (£1.50 each) from a vast selection of ingredients such as spicy njuda, merguez sausage and smoked salmon, followed by speciality cheeses (£1.95 each) including smoked provola, Fontal and Pecorino. Veg is up next (£1 each), with butternut squash, chestnut mushrooms, curly kale, and you can finish off with herbs. The pizza is then cooked in the wood fire oven for no more than two minutes and boom, it’s ready. Side dishes include creamy burrata (we had ours with beetroot and mint) along with fresh salads. These were really great but the real winner was our DIY pizzas. I went for the standard Margherita base, with veal meatballs (I cannot stress enough how well these work on a pizza), chicken breast, red onions and sweetcorn. Normally I find myself feeling bloated and full for days when I eat pizza, but I didn’t at PizzaBuzz, thanks to their unique blend of spelt flour, which aids digestion. I love the concept. We have a place (restaurant chain) here where you can customize anything on the menu.. and they do pizza as well as burgers, sandwiches, mac & cheese, salads, and even milkshakes. I have found that the customization while a bit pricy here, it’s a great way to create something everyone likes.